Enterprise communications platforms have undergone a fundamental shift, migrating from traditional, onpremises, TDM-based PBX to highly agile, IP-based unified communications and collaboration platforms. This evolution has not only enhanced the means and efficiency of communications among employees, partners and, most importantly, customers, but has also enabled highly flexible and innovative deployment opportunities. Today, businesses can choose from a number of delivery models, from on-premises solutions deployed within a data center environment to fully hosted unified communications as a service (UCaaS) solutions implemented within public or private clouds. Converging voice and data communications and collaboration applications on a shared IP-based network affords businesses a wealth of integration and cost-saving opportunities, but this level of convergence requires unique considerations. Specific attention must be paid to the quality of wide area network (WAN) links that connect remote locations to the business and all locations to the outside world. 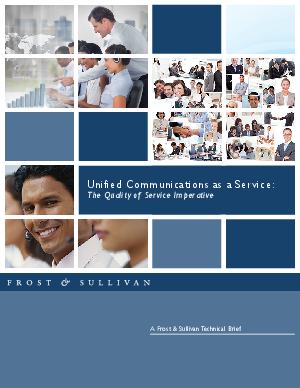 This technical brief outlines the benefits UCaaS can offer businesses and identifies key architecture considerations for deploying cloud-based enterprise communications that ensure the highest levels of service quality and reliability.